Find NEW & USED SNACK VENDING MACHINES FOR SALE! The SNACK VENDING MACHINE SUPPLIERS! 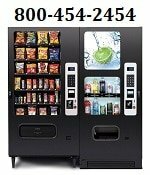 Please contact the snack machine equipment suppliers direct for more information about their snack vending machines pricing & details. Gumball.com is THE gumballs & gumball machine megastore! SNACK MACHINES FOR SALE! We got our start in 1993, we stock a wide array of vending products ranging from the classic bubble gumball machine to professional grade SNACK & SODA VENDING MACHINES, bill changers, bulk gumballs, super balls, flat vending-stickers, toy capsules, replacement parts and more. It’s in our name and we promise our gum balls and bulk candy will always be fresh. To shop online now go to www.Gumball.com. RPD Corp. – Electronic Countertop Snack Vendor – The ideal vending system for small to medium locations. Features 20 snack selections, bill validator capable and ultra compact size that will meet your offices needs now and in the future.